In a “not-so-surprising” yet unexpected news, the budding MBA graduates seem to have been running out on their luck in the recent present times. Back in 2012, a study revealed that out of 5 lakh pursuing MBA only one fifth seem fit for jobs. 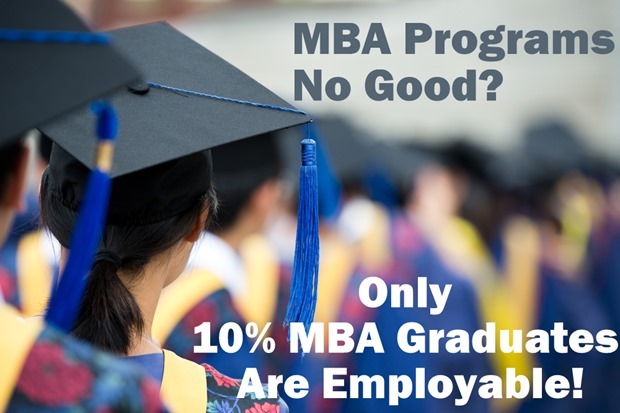 A revised analysis reveals that only 10% of the graduating MBAs are employable! In 2013, Mr Jay Bhatti, co-founder of ZABA Search ( or previously known as Spock.com is the world’s leading search engine on people) went on record saying, “ If you can’t get into a top five MBA program, don’t even bother”. When he said, top 5 MBA programs, he meant graduating from Wharton, Stanford, Kellogg, Harvard or MIT. Sure the words stirred up a minor controversy, but the situation is no different here back home. The ones who can bell the “CAT”, graduate with pretty good offers, which seems as a relief after paying hefty fees. However most of the MBA aspirants will tell you they’d want to get into one of these: IIM Ahmedabad, Bangalore or Kolkata. But there are other 3,364 institutions that provide MBA that co-exist, getting a job for outgoing graduates from these firms has been a nightmare. Dig deep into the problem and you’ll know there are 2 reasons why the industry is tight zipped when it comes to hiring them – Lack of industry skills and excess supply. Many industry experts feel that the syllabus does not go hand in hand with the Industry and global trends. With easy evaluations and less practical knowledge workshops, students are confined in a bookish atmosphere while MBA is a vibrant course that must help them take their business forward in the dynamic atmosphere. The campus recruitments have gone down by almost 40% this fiscal where the management seats are presently stabilized at 4 lakhs (approx.) However in this hoopla, 180 B-schools shut down due to dearth in MBA faculty. Smriti Irani, the HRD minister has given a green signal to set up more IIMs to help more students get quality business education. With IIMs doing an impressive job, in the recent past India has attracted more MBA aspiring student population. Let’s hope our B-school gurus revisit their syllabus so that our business administrators don’t have to wait for a miracle (taaki unke saath koi chamatkar na ho jaye! Nasscom Says Only 25% Graduates Employable, Is There A Solution? Are B-Schools ratings creating system like caste system for B-Schools? To what extents they are truthful? Here is the facts which I have collected from internet and peers. Every year in the month of January, many of B-schools aspirants in India refer to B-Schools ratings published by magazines, web portal, coaching classes (e.g. Pagalguy, careers360), etc. but has anyone ever thought about how these conclusions/ratings are made? Do they publish the data collected, methodology used for these surveys? The answer is No. These ratings decide the fate of millions of B-Schools aspirant, and we never consider basis on which these reports of formed. Why??? B-schools ratings have made the colleges to become placement agencies rather than “Vidyamandir” or “Gyanmandir”. It is claimed that Zero (0) and Pythagoras theorem were invented in India, but that was centuries ago, what has been invented in India in 19th, 20th centuries? If we do not stand up now, I am regret to say India will lose the same opportunity in 21st Century. Then who will solve our issues like poverty, sanitization, water supply, power etc., is it US, UK, Russia, China, Japan? Again we will beg to developed countries to transfer technical or functional resources. Here is some of the facts and figures about B-Schools in India, needless to say they are disappointing. 1) More than 90% of the students in these elite schools are fresher’s, more than 75% of candidates are engineers and more than 95% of students are students from English medium school. For engineers who have studied in atleast english medium schools these tests (CAT, CET, CMAT) are like piece of cake. Is this right to equal opportunity in India? –In US elite B-Schools (like Harvard, Yale, Stanford) have mandatory requirement of minimum 3 yrs. of prior exp. –Have you ever seen or heard MBA graduates from Harvard, Stanford or Yale doing full-time MBA in later part of their lives? –These colleges garner cheap publicity based on their placement figure of lakhs and crores but truth is the in hand salary or amount is much less than what they publish. 3) I am astonished to see that college in which teacher like prof.Prassana Chandra teaches Finance is not even mentioned in the list. In fact many of the students in B-Schools learn finance from his books only. 4) Faculty in Sydenham (SIMSREE) and JBIMS is same (to a many extent)!! !, even some faculty of JBIMS teaches in TISS(if I am not wrong). Then how is the rating so completely different? 5) How many case studies are published by them every year (e.g. Harvard Business Review) and how much research is done by students in the elite colleges and how much of it is really useful and applicable, it is as good as nothing compared with cases in western colleges? So, is placement package the only criteria to determine ratings of the colleges? What about the quality of education? 6) In USA and European countries placement criteria is not at all used to rank the college and Many students in Ivy colleges get placed in off-campus placements (i.e. Careers Fairs conducted by universities or companies)…again in India companies do not do it because their top bosses are alumini of these college and they want their alma mater to get elite tag. 8) My aim is not to malign any of the college or any of their alumini. In fact based on such reports many recruiters take candidates from such colleges which I feel is wrong and against the merit (check out iimjobs.com portal). Haven’t we created system (tier 1,2,3,4,5,6 etc.) like caste system which still prevails in our country, for B-Schools?. Based on ratings of these reports many colleges are not even allowed to participate in B Schools competition like Competitions conducted by Mahindra, TATA Motors, and HUL companies’ etc. exclusive clubs of so called elite colleges. Is it a fair competition? 1) Can the elite colleges claim the same? 2) Do their students have sufficient prior work or social diverse experience in life to gain master’s degree from the elite B-schools of India? 4) Cannot we say that CAT, CMAT CET are aptitude testing exams for some god gifted students to quality for these B-schools? In fact many students take a drop for 1-2 yrs. to get into these colleges, isn’t it shortcut to become business leader? This is one of the main reason that these Indian elite colleges cannot even be compared with Ivy League colleges of the world like Harvard, Yale etc. 5) Do we ever see a surgeon in the hospital doing surgery who has never attended a single patient as a junior doctor (i.e. during or after MBBS)? Can we ever fly in a plane whose pilot has zero hours of flying experience? Then why MBA’s or MMS or PG graduates in management (finance, marketing etc.)??? I hope B-schools will concentrate on imparting quality education, giving right pedigree rather than being placement agencies, it will only help India to create leaders for tomorrow else as usual G’s are getting produced. The writer uses apostrophes in plural for MBAs incorrectly. Likewise “IIM’s” is also wrong. There should be no ‘ in plural.